Everyone has been waiting for this update, and it’s finally here! You can now get PerfecTile for Windows 10 and create image assets for your shiny new Universal App. You also need this Tool now more than ever. 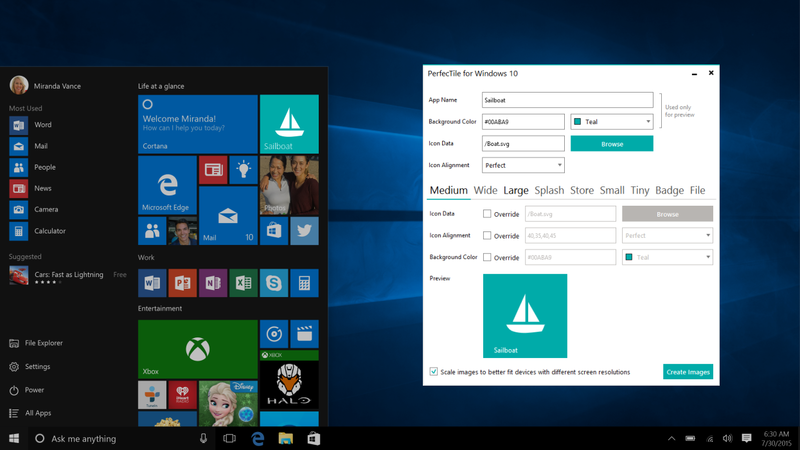 Universal Windows Apps run on screens of different sizes and resolutions, so does your App’s Tiles. You’ll need to supply 44 images with different sizes & scales to make that possible. PerfecTile supports all those Images of different sizes & scales which you’ll be able to create in few clicks. This tool already has all the features you’d expect like – support for vector icons as well as png files with transparency, preset Icon paddings, file naming conventions, etc. You can purchase PerfecTile from GeekChamp Marketplace, or download your free upgrade if you’ve already purchased it from Marketplace tab here. PerfecTile for Windows 10 is only $9.99 for 2 days. Get it while it’s Hot!